The first wireless low-mounted external volumetric detector to be added to the Pyronix range. The new XDL12TT-WE delivers long range signalling, multi-award-winning two-way wireless technology, heightened false alarm immunity with Dual-Vision Pet Immune detection technology, as well as a host of features that make this a steadfast detector that’s quick and easy to install. Offering 90° detection (install between 1-1.5m), the brand-new XDL12TT-WE can provide a maximum detection range of 12m. This multi-award-winning technology delivers easy installation and superior security, with full supervision, anti-jamming and 128-bit wireless protocol encryption to maximise reliability and ensure the signals transmitted by the system are protected and any code-grabbing is prevented. 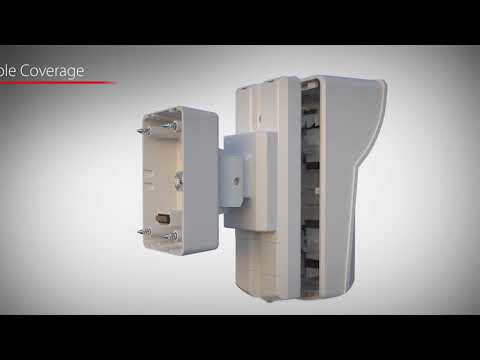 Each Pyronix two-way wireless device is both a transmitter and a receiver, providing a wealth of installation benefits. The high sensitivity receiver allows a wireless signal range of up to 1.6km in open space, which eliminates the need for repeaters and therefore reduces the installation costs. The high-sensitivity antenna of the XDL12TT-WE ensures that the signals being transmitted and received are as strong as possible. Utilising Gaussian Frequency Modulation (GFM) to spread the signal, while reducing unwanted noise and harmonics, enables the XDL12TT-WE to meet stringent European, ETSI and other worldwide standards. The Instant Two-Way Device Control (ITDC) of Enforcer two-way wireless technology in the XDL12TT-WE enables the instant wake-up or sleep of devices as the system is armed or disarmed. So, when the system is armed, the XDL12TT-WE is instantly and constantly awake, without any sleep timers, unlike other devices on the market. When the system is disarmed, the detector sleeps. This setup delivers enhanced security, with increased battery life. Consisting of two independent Passive Infrared (PIR) sensors and one microwave (MW) sensor in one common housing, the Tri-Technology (TT) of the XDL12TT-WE delivers advanced outdoor protection. The XDL12TT-WE utilises Tri-Signal Detection Logic alongside TT, whereby to identify the presence of an intruder, all three sensors of the detector need to be activated sequentially in quick succession to create an alarm. The two PIRs of the XDL12TT-WE have a dedicated volumetric field of view. The top PIR detects outwards and up, while the bottom PIR detects outwards and down, without either crossing the central horizontal plane between them. This setup of non-overlapping PIR sensors alongside Tri-Signal Detection Logic, delivers highly secure sequential detection and increases its tolerance to pet immunity. An advanced filter that is designed to protect against false alarm activations in environments with windy weather conditions and swaying vegetation. With Anti-Sway Analytics, the XDL12TT-WE maintains optimum levels of performance as the digital filter allows it to distinguish the movement of trees and plants from the movements of an intruder. The XDL12TT-WE boasts an IP55 weatherproof rating, which means that whatever the weather, the brand-new detector is durable and reliable, with protection from dust ingress, high density rain, snow and water jets from any direction. The rubber gasket on the lens and the foam gasket of the detector create a sealed environment that protects the XDL12TT-WE from all weather conditions and humidity. Everything about the XDL12TT-WE has been developed for resolute reliability. Made of thick polycarbonate plastics, it is robust and protects the electronics from adverse conditions and any sabotage attempts. It has also been moulded with a stabilising material to prevent discolouration over time to maintain a stylish and uniform housing. The XDL12TT-WE can provide either volumetric or curtain coverage depending on the area that needs protecting. Each lens can also restricted with lens inserts to adapt the coverage area. This is particularly useful in areas such as: if the premise is close to a busy road or pathway, driveways or garages, where external interferences can cause false alarms. The XDL12TT-WE can be fitted with a range of mounting options to deliver the perfect angle and coverage pattern required. The detector can be purchased in three different frequency bands. This avoids any interference (cross-talk) that can occur when two or more detectors with the same frequency band are installed within close proximity of each other. This optimises the XD’s stability and also allows it to be fitted with a fixed bracket, which enables two XDL12TT-WE’s to be fitted back to back, which, together, provides 24m range with 180° volumetric coverage.